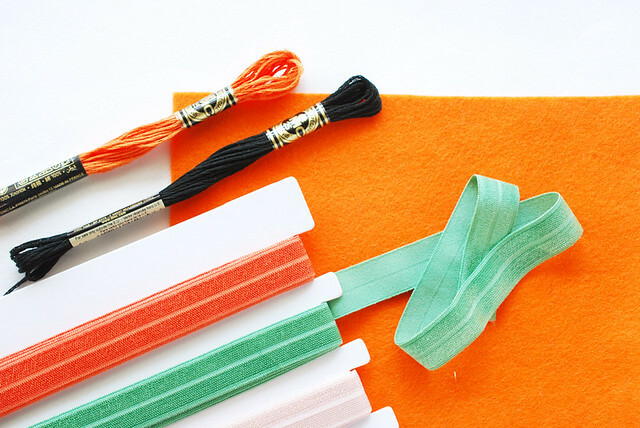 Ever since I pinned this pin, I've been wanting to make a stretchy elastic book mark, or as I'm calling it, a book band. 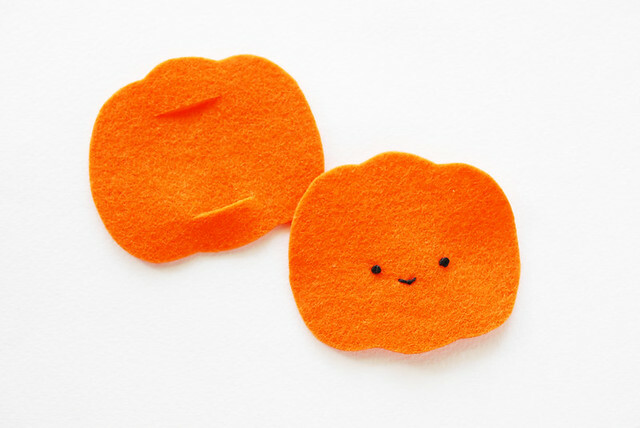 I still want to make one for all year, but after spotting my orange felt and some green elastic, it became apparent that I needed to start with a pumpkin version! The elastic I'm using is fold over elastic, which I bought on a Pick Your Plum special. 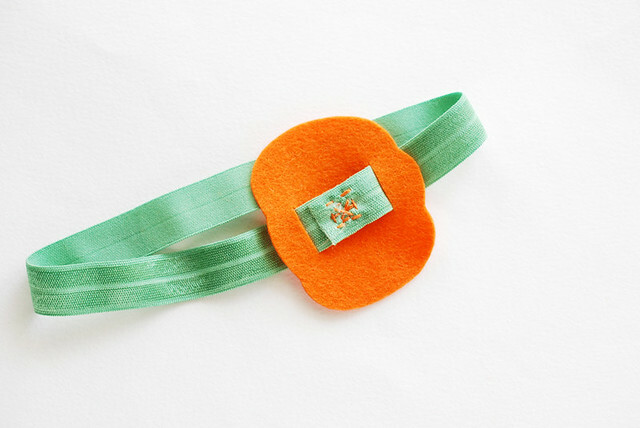 You can find similar materials on Etsy (just search for "green elastic") or use any elastic you like. Because mine is green, I omitted a stem on my pumpkin, but in the template PDF, there's a stem if you need it! Cut out two pumpkins from felt. Use the pattern in the PDF as a guide for stitching a face on one piece. Use the other pattern as a guide for cutting two slits in the second piece. If you're using narrower elastic, cut the slits to match the width of your materials. Cut a piece of elastic that is about 15 inches long. This is a good all-purpose size for the fold over elastic because it's super stretchy. Test your elastic, and adjust the size accordingly so that it will stretch around your book when sewn in a loop. 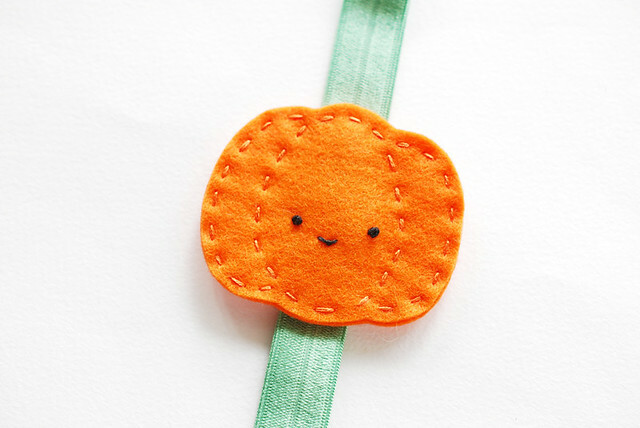 Slide the elastic through the slits in the pumpkin, stitch it into a loop, then slide the stitched ends to be over the pumpkin. It doesn't need to be especially pretty, just secure, as the ends will be hidden inside the pumpkin. 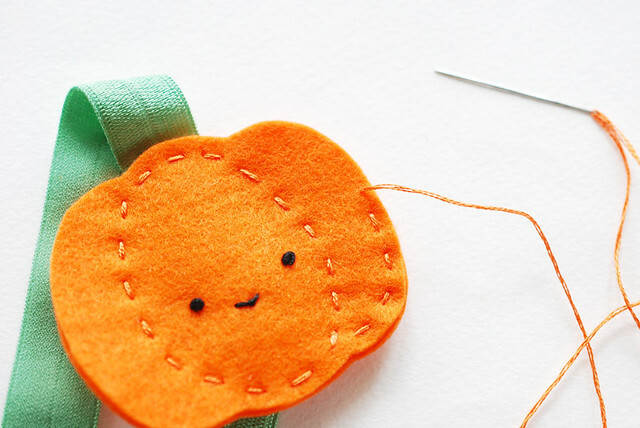 Place the embroidered piece on top of the slit pumpkin, then use running stitch to hold the pieces together. 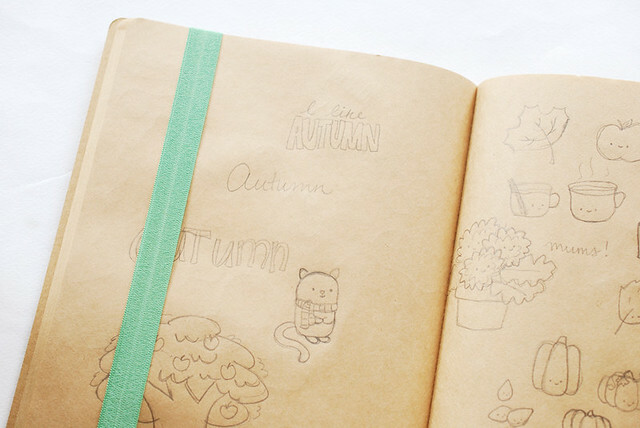 The template PDF has a guide for where to stitch, but it's pretty easy to just freehand it. If you're adding a stem to your pumpkin, you would need to sew it in place between the layers as you are stitching them together. ...or use it as a traditional book mark! This would also work as a headband, but I'd recommend that you rotate the slits so the pumpkin sits on the band better on your (or your child's) head. Now that I've actually made something that I've pinned (or at least something like it), it's your turn! Pin this, then do it! This is a fabulous idea...my mom uses a rubberband around her books...I need to make some of these for her for xmas...thanks for the inspiration and I love your....Pin this, then do it. 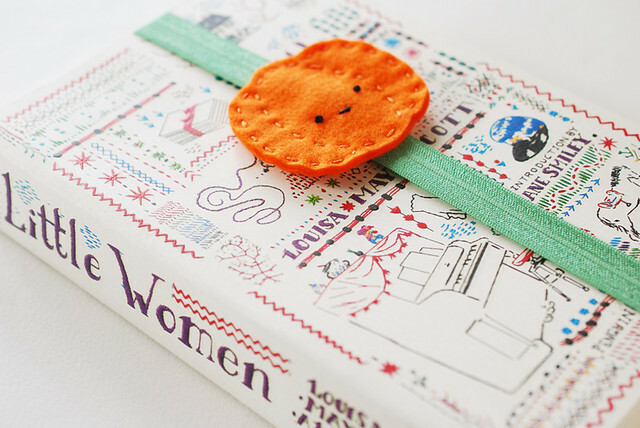 That Little Women book is fantastic! I want a copy like that. And the punkin is presh. Thank you so much for this post. 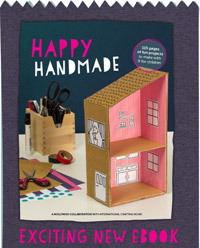 I want to let you know that I posted a link to your blog in Creative Busy Bee Craft Inspirations, under the Page 5 post on Oct. 09, 2012. Thanks again. haha! 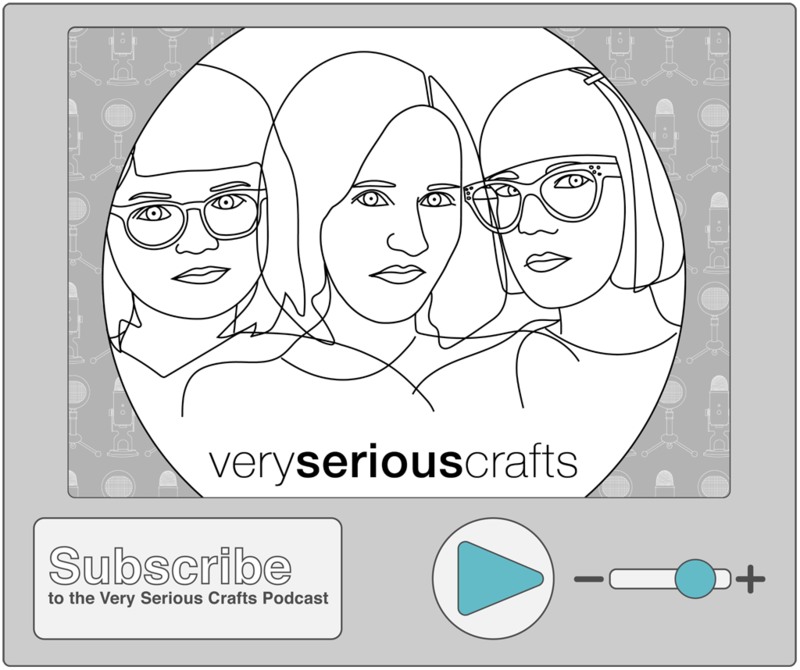 you've had some super cute projects yourself, dear! What an adorable idea!! Thank you for the inspiration. This is cute! 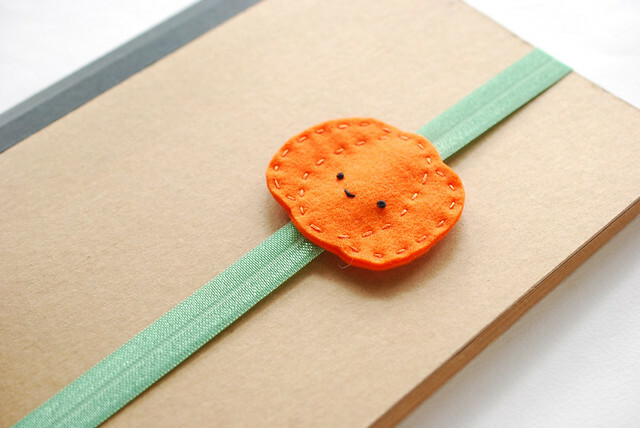 I've been using fold over elastic to mark my page in my planner, and I think it's time to upgrade by adding a festive little pumpkin. 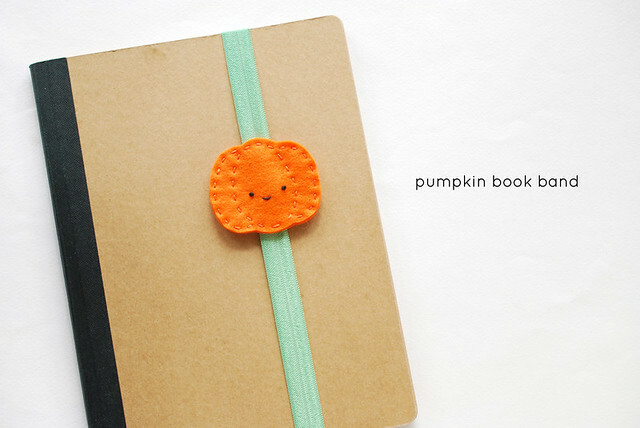 Such a sweet idea and I love pumpkin, might have to give this a try! Thanks for the awesome idea! Thank you so much for this post. 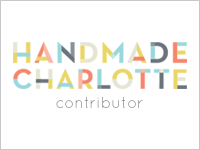 I want to let you know that I posted a link to your blog in Creative Busy Bee Craft Inspirations, under the Page 1 post on Oct. 10, 2012. Thanks again. I will check back here or, if it's easier for you, my email is marybtanck at gmail dot com. Isn't it wonderful!?! 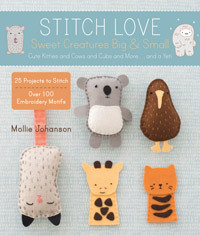 It's part of a series of classics all with stitched cover designs! Woah. 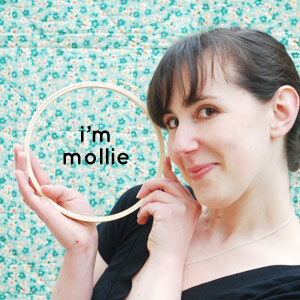 Mollie this is just so cute! !